A Thangka is a painted or embroidered Tibetan banner which was hung in a monastery or a family altar and carried by lamas in ceremonial processions. In Tibetan the word ‘than’ means flat and the suffix ‘ka’ stands for painting. 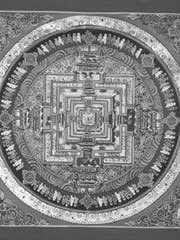 The Thangka is thus a kind of painting done on flat surface but which can be rolled up when not required for display, sometimes called a scroll-painting. The most common shape of a Thangka is the upright rectangular form. The physical construction of a thangka, as with the majority of Buddhist art, is highly geometric. Arms, legs, eyes, nostrils, ears, and various ritual implements are all laid out on a systematic grid of angles and intersecting lines. A skilled thangka artist will generally select from a variety of predesigned items to include in the composition, ranging from alms bowls and animals, to the shape, size, and angle of a figure’s eyes, nose, and lips. The process seems very scientific, but often requires a very deep understanding of the symbolism of the scene being depicted, in order to capture the essence or spirit of it.